It's been almost 2 years since our last blog. Needless to say, we've been pretty busy (not that that's a good excuse). How appropriate that the first thing we feel a pressing desire to write about, would be the continuation of what we wrote about last (Our Sustainable Future). "It's an idea I had where people can invest in coffee trees that will allow farmers to grow their business" as Shane explained the own-a-tree idea. "I'll do it" I impulsively replied (I have never been one to avoid sporadic and life changing ideas). I'll never forget what Shane said next. "You can have it, but only if you do it well, and do it right." In March of this year I visited an 86 year old friend in the Norde region of Haiti. He is a dear friend of mine named Philemon. 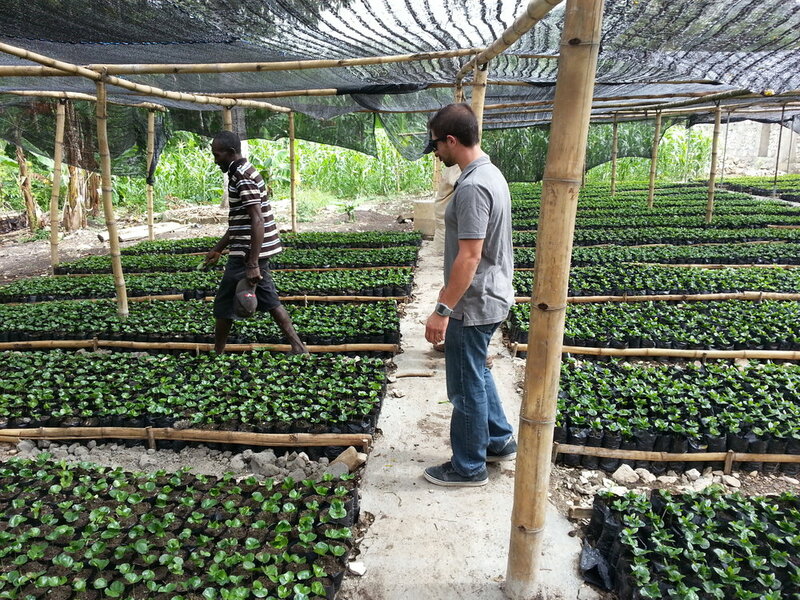 Since that day with Shane, I have been employing coffee growers in Haiti. I felt I could do nothing less after I had experienced and seen what I had in Haiti. Philemon is one of those coffee producers... or at least, he was. Philemon looks out over his leaf rust infected farm. There were once hundreds of coffee trees on this slope. I walked into his home and he led me by my hand out the back. Towards his coffee trees. He stopped, and pointed out slowly at a series of La Roya infected Plants. A look on his face as if he was still having trouble believing it himself. Hundreds of trees producing no fruit, in the midst of harvest season. An empty farm now. A dead one. Philemon, brought me back inside and put some rice and beans on the fire. His wife had something that made her feel her legs were paralyzed. Translation can get kind of hard sometimes. There are no words in Haitian Creole for some of our words in English... but I think they were saying it was gout. Here they were in the midst of extraordinary suffering, and they are cooking me lunch. I instructed him to plant beans in his yard for food and begin working on the coffee again. He smiled and agreed. Philemon didn't ask me for a thing when I left. He never has to this day. I came home angry. Partially at myself, and partially at the situation. My emotions torn between wanting to help this man, yet simultaneously not wanting to contribute to the problems caused by most NGOs and humanitarian/ church groups in Haiti. We have a sustainable program. We don't just give coffee trees away. Farmers buy them for cost. That is how we ensure that the own-a-tree system grows. That is how we ensure it is going to last. It is how we know, for a fact, that people won't just take the coffee trees because they are free. Instead it guarantees they actually want to be growers and commit to our organic and specialty coffee standards. I mean- do you, our customer, want them to be growing your coffee and not commit to that system? If you want to know more about how aid hurts Haiti, I would be happy to discuss it. I mean, you could just Google it too. Either way. But that is not where we are going with this. Not today. Today was a lesson for me. Sustainability while working in developing countries is of vital importance- but there is sometimes what can be classified an emergency. An emergency being a tsunami. An earthquake. An outbreak of a virus. These are emergencies. Similarly, an 84 year old man who has no money, a paralyzed wife, and a ton of dead crops. This too is an emergency in a different way. Let me preface my next decision with a couple points. This "emergency" is not the same as when a natural disaster occurs, which would be one of the only times I would personally approve of donating imported goods to people in a developing country. Therefore, it does not call for me to donate him shoes. It does not call for me to import food. It does not call for me to do anything, that will not in the end bring business back to Haiti somehow and help the country as a whole. Why? ...because we have literally caused the unemployment in Haiti to become over 65% due to foreign aid and lack of sustainable assistance, and personally I want to be very careful that my decisions to help one person do not end up hurting ten more. I wrestled with the thoughts until one night I found myself buying a flight to return. I arrived a few days later and was happy to see that Philemon's bean plants were already taking some fruition. His wife stood slowly, and used a walker to get around the small concrete room. Farm still dead, but small improvements made me smile. As always, he cooked me a meal. We ate and had good conversation. About his family. About his church. About the joys of his life he was so excited to share. It began to rain, and I arose to say my good-byes. Philemon and his brother Samuel (another coffee producer) accompanied me to my car. They stood in the rain, waiting for me to depart safely. Engine running, I sat for what felt like a long moment. Deep in thought. See, although we do provide donations to the own-a-tree project, in short, it has to be able to function independently and in a sustainable way. It could not do that if it is giving away free product (nursing trees). 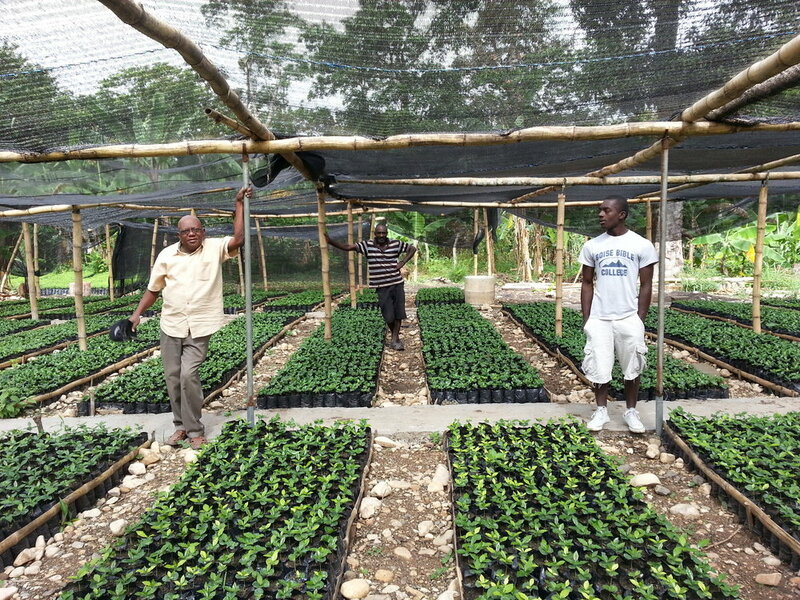 Coffee growers can buy the trees, and even pay later with their first harvest. Which I believe is a huge advantage for them. That however takes 4 years for the plants to mature, and for an 84 year old I feel like 4 years is a long time to be waiting on some fruit. I rolled down my window and bid Philemon back into the car. Both dripping wet at this point, he joined me by climbing into the passenger seat. Cautiously, because this is never something that I do without much thought and proper analysis, I handed him enough money to replenish his farm from the nursery. Now he would not have to wait the four years for a mature plant. This solution would allow that the money to still go back into planting more coffee trees as the own-a-tree donors were promised, but this man now gets bumped to the front of the line, which I unapologetically feel was appropriate. We embraced for a moment and exchanged a final good-bye. He told me he was excited for me to return in a few months and see his new farm. I thought to myself as I drove down the wet mountain, how much I was looking forward to that moment.